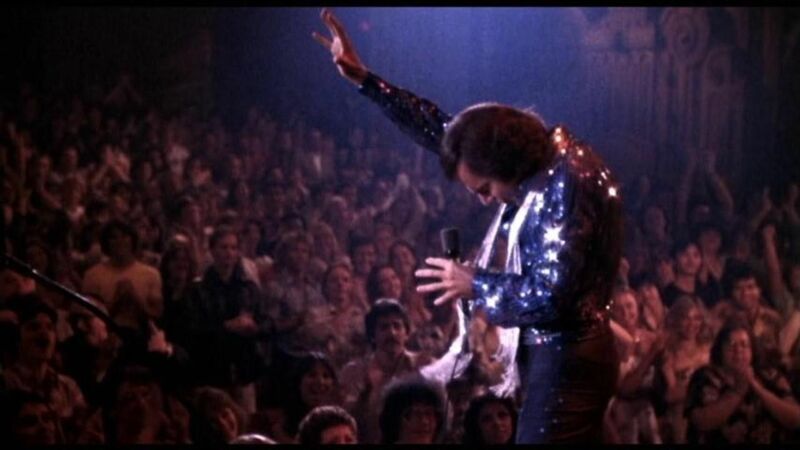 Neil Diamond has nothing to be embarrassed about when it comes to The Jazz Singer, at least musically. Diamond is a true songsmith, creating a fantastic set for the third version of this story. Even acting-wise, I won't bash Diamond because judging from his work here, he did the best he could in his film debut. Granted, it was not a very good performance, but somehow he managed to do better than one of the greatest actors of the Twentieth Century, who just embarrassed himself. Yussell Rabinovitch (Diamond) is a young assistant Cantor at the temple with his father, the main Cantor (Laurence Olivier). 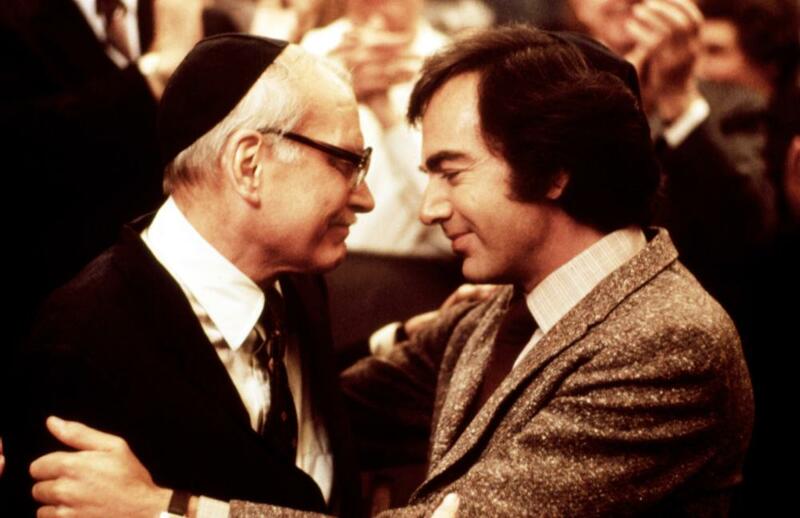 Yussell, married to Rivka (Catlin Adams) wants to be a good son and nice Jewish boy, but he also has a secret passion for contemporary soul and rock music (oddly, not jazz, but that's beside the point). 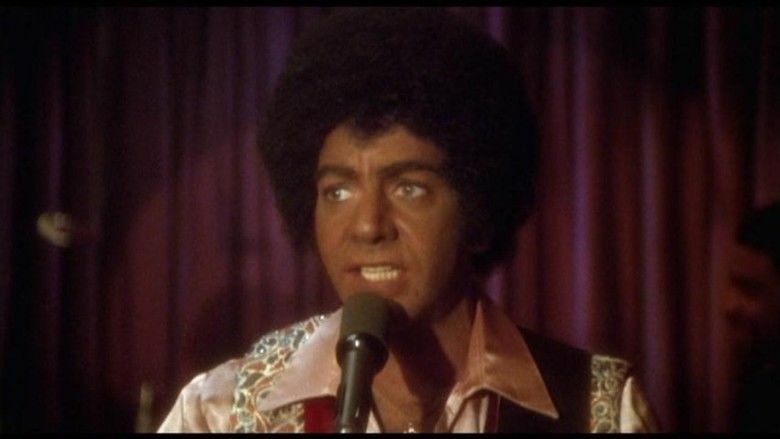 He has been performing with a group of African-American friends in various clubs, and at the latest gig has to don blackface in a failed effort to mix with the African-American audience. This brings his secret life into the open, much to Cantor Rabinovitch's displeasure. Yussell works to be the man his father wants him to be, but then his friend Bubba (Franklyn Ajaye) in California working as a background singer, tells him that one of Yussell's songs, Love on the Rocks, is getting covered on an upcoming album. Yussell is asked to go to California for two weeks, and he goes with the reluctant blessings of the Cantor and the silent acquiescence of his wife. Yussell, who goes by the stage name Jess Robin, is unhappy by the rock version of his ballad and shows the singer how it should be done. Even though this gets them all fired, his original version intrigues Molly Bell (Lucie Arnaz), who works at the studio. She soon becomes Robin's manager, forcing a gig as a last-minute opening act to the curiously named Zany Grey. While Robin is a success, Rivka is unhappy with her husband, yearning for the old life in New York's Jewish community and not the flash of California. Jess, however, needs to follow his muse and what he thinks is his true calling, and Rivka leaves him. This allows him the opportunity to knock boots with Molly, and the sight of this shiksa and Yussell's abandonment of five generations of Cantors sends his father into hysterics. From what I understand, Jess' musical career is a betrayal of Holocaust survivors, at least in Cantor Rabinovitch's mind. Despite having a big television special booked, Jess is in too much emotional turmoil to go on. He flees and becomes a wandering minstrel, singing in various honky-tonks. Eventually Bubba finds him and convinces him to return, not just to his career and Molly, but their new baby, Charlie Parker Rabinovitch (the closest connection to jazz the film actually has). Getting ready for his comeback appearance as yet again Zany Grey's opening act, Jess is asked to perform the Kol Nindre for Yom Kippur, his father unable to. He does go and reconciles with the man who declared him dead, the joy of his grandchild breaking the ice. Jess Robin then takes to the stage, with Cantor Rabinovitch and Molly together in the audience, as The Jazz Singer belts out his new song, America. 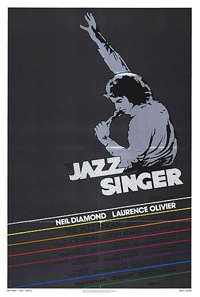 As I watched The Jazz Singer, I thought the filmmakers could have saved themselves a lot of time, effort and embarrassment if they had opted to make a Neil Diamond concert film rather than adapt a silent film that had already been remade back in 1952. This is especially true given that more than once, The Jazz Singer consisted of Diamond performing before live audiences, whether it was Summerlove, America or even a countrified version of You Are My Sunshine. As a side note, this section where Robin wanders across Texas made me wonder whether Diamond harbored a secret desire to be a country singer and was allowed to live this dream out, given that it made little sense in terms of the film itself. Not that his ghastly blackface made things any more logical. Whether this was screenplay writer Herbert Baker and director Richard Fleischer's odd tribute to the original film or some wildly misguided bit of comedy we don't know, but I can imagine audiences cringing rather than laughing at this, and the passage of time has made this scene look worse. At least the original had the benefit of being in a time when blackface was acceptable, which does not make it right, but at least within some context of reality. Misguided is the best word for The Jazz Singer, starting with the fact that there was no actual jazz sung. I know they kept the title for name recognition and to stay true to the original, but it sounds silly to call it 'the jazz singer' when he doesn't actually sing jazz. That is a minor point compared to the misguided performances. Laurence Olivier should be remembered for his brilliant turns on stage & screen of his beloved Shakespeare, but at the tail end of his career he was humiliating himself with tawdry projects. Perhaps not as shocking as the never-released Inchon, The Jazz Singer has to be among the lowlights of Lord Olivier's résumé. Forever hamming and coming across as hysterical, unhinged or dotty, Cantor Rabinovitch is unintentionally funny. His 'distress' at the young woman his son has taken up with is downright laughable. I'm not going to bash Arnaz much given she was given very odd directions. For example, when she 'offers her body' to Jess she's directed to make this into a humorous suggestion, but then she looks as if she's genuinely upset and puzzled as to why Jess didn't take her up on her offer. It makes Molly among the dumbest characters in film history: apparently unaware that offering her body to a married man makes her look sleazy. Not that in the 'romantic' montage her serving ham to a Jewish Cantor doesn't already make her look downright like a yutz. As for Diamond, I still think he did his best but he's obviously not an actor. The script gives him little to work with: we don't know what is in him to create such ballads as Love on the Rocks. We don't know what motivated his dreams, and as a side note, someone should have told him to cut his hair. He said the lines, sometimes convincingly, so there's that. He was better and more confident when singing, which is his forte. Again, a concert film would have been better, cheaper and more productive. As lousy and ill-conceived as The Jazz Singer is in terms of acting, writing and directing, let alone as a vehicle for Diamond, the soundtrack itself is a wonderful piece of work. The songs are all pretty great except for perhaps On the Robert E. Lee, sung at what is the squarest Hollywood party in history. There's a banjo in it for goodness' sake! The Jazz Singer is longer than it should be (we could have cut Diamond's country troubadour bit) and disorganized (Jess' struggle with his family and heritage sometimes falls by the wayside). Apart from the music there isn't much to recommend in it, unless you count the camp humor at its unfortunate silliness. My recommendation is to buy the soundtrack and watch The Jazz Singer only if you want to laugh at how it all went wrong.